The recent adoption of the AX-25 \1} standard for radio-amateur packet radio has been a significant milestone towards a more widespread use of digital communication. So far efforts concentrated on the digital and logical requirements of this new form of communication. Adopting essentially the existing X.25 standard has some potential problems, though, when facing the realities of Amateur Radio. The X.25 standard had been designed for the "good" communication links normally used in the commercial environment. With amateur signals often fading into the noise and with QRM being quite frequent, the AX.25 standard may be less than ideal. 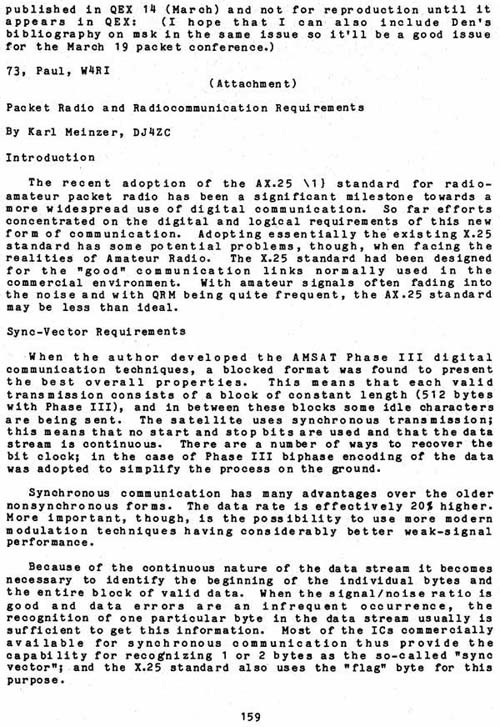 When the author developed the AMSAT Phase III digital communication techniques, a blocked format was found to present the best overall properties. This means that each valid transmission consists of a block of constant length (512 bytes with Phase III), and in between these blocks some idle characters are being sent. The satellite uses synchronous transmission; this means that no start and stop bits are used and that the data stream is continuous. There are a number of ways to recover the bit clock; in the case of Phase III biphase encoding of the data was adopted to simplify the process on the ground. Synchronous communication has many advantages over the older nonsynchronous forms. The data rate is effectively 20% higher. More important, though, is the possibility to use more modern modulation techniques having considerably better weak-signal performance. Because of the continuous nature of the data stream it becomes necessary to identify the beginning of the individual bytes and the entire block of valid data. When the signal/noise ratio is good and data errors are an infrequent occurrence, the recognition of one particular byte in the data stream usually is sufficient to get this information. Most of the ICs commercially available for synchronous communication thus provide the capability for recognizing 1 or 2 bytes as the so-called "sync vector"; and the X.25 standard also uses the "flag" byte for this purpose.